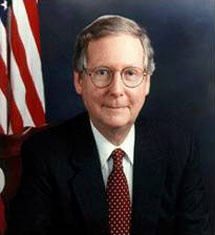 AKA Addison Mitchell McConnell, Jr.
On 6 December 2012, with the intent to demonstrate that Democrats did not have support in the Senate, he brought up legislation to largely transfer authority to raise the US Debt Ceiling to the President. His bluff was called, and as McConnell had brought up the matter in bad faith, he had to resort to filibustering his own bill. Father: Addison Mitchell McConnell, Sr.